Stefan Mecay holds off the charge from 2006 runner-up Chris Byrd in the semis. Eric Brosius and Tom Drueding observe as newcomer Rick Byrens goes up against jim Falling in semi-final action. An interesting observation is that the game continues to evolve. For a while it seemed like the AP was winning in the elimination rounds but that seems to have been reversed with the Final going to the CP rather than the AP. 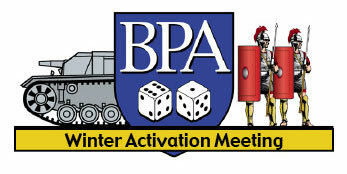 Attendance was down significantly with the start date changed from Monday morning to Sunday afternoon. So next year it will probably be started Monday morning again. I had a wild Final with Jim Falling. I was the CP as he had bid 3 for the allies. 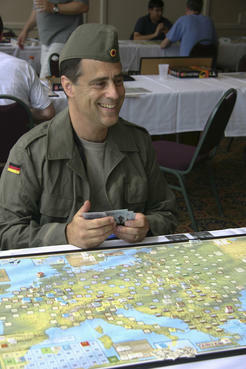 I started with GOA, but I ended up retreating to the Rhein early and had an anxious moment when I failed my trench roll in Frankfurt and he was able to hit me at 9a vs 9a, but lucked out and survived his 13 in 36 chance to break into the Rhein. I then got my trench and was able to trench all three Rhein spots stabilizing the east. Jim next switched to a heavy Near East strategy. He got the Caucasus on Turn 4 or 5 and hit Erzerum, but I got my 50-50 flip hit to stabilize that front. MEF came out and was blocked with three Turkish corps. I sent a German Army, with a Sud Army and a total of four German corps to take care of the Serbs and he countered with Salonika which brought in threeBRc and a couple of Italian Armies. Things got really heated in the Balkans when the French Orient appeared around Turn 8 or 9. I ended up SRing two more German armies down to the Balkans and the entire Italian army came across to help while a few French were able to guard the north. At one point the FR Orient was only two squares away from Constantinople! Fortunately, I lucked out and got my first trench roll with my Turkish Army and even more fortunately his Allenby sequence was messed up with Sinai Pipeline being buried on the bottom of the deck but Allenby coming out in the first TW hand or Turkey could have easily collapsed there. With the extra German Amies and lots of corps, I was starting to stabilize the Balkans when Romania appeared and some Russian Armies came screaming down to help. I was able to send more AH armies to help, and eventually stabilize a battle of Greek/Italian/French/British/Serb/Romanian/Russian/Montenegran alliance vs a German/AH/Bulgarian/Turkish alliance. It was definitely the most interesting set-up I think I've ever seen down there, LOL. Eventually after much effort and back and forth battles, I was able to stabilize and eventually destroy most of the Russian Army as well as successfully blitz Egypt during one turn where I had two 5's, three 4's, and a couple of 2's. The Allies were able to do a great last push in the west, narrowly missing several forcing retreats by one spot on the dice and knocking out a couple of German armies, but on Turn 14, I was able to successfully play Lloyd George on a BR MO turn for another point and a breather to rebuild the west wall defenses. At this point, with only four RUS armies left and the CP set up to push everywhere in the east and the French Orient bottled up in Greece, Jim saw the handwriting on the wall and surrendered. I thought Jim played a magnificent game and came extremely close to winning the battle in the Near East which would have given him the win. He did a great job of passing up early events like FR/IT/BR armies, etc, to keep the pressure up in the NE. Change a couple of die rolls and/or if the Allenby sequence came out better, he had a great chance to knock me out. I thought it was an extremely well played Final and a lot of fun, Jim is a great guy and a lot of fun to play against. I'd also like to give kudos to my friend Chris Byrd whom I played in the semi's. He outplayed me in the Near East by using MEF a couple of times to eventually set up an attack with three BRc vs 1 BUc with Hurricanes for a 5c+1 vs 2c. If he gets anything but a 1 or I get a 1, he wins the game right there, but fortune smiled on me and I totally lucked out making the one in seven chance to survive. The little Bulgarian that could I guess. 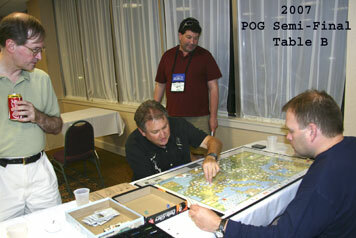 20 meat and potato wargamers, including four former PoG WBC/WAM champions, participated in the cornerstone WAM tourney. 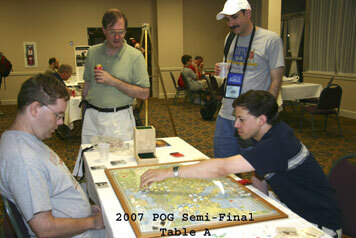 At the end of the 2008 PoG-a-thon, one former champion was left standing clutching the gold. The usual mulligan round started at mid day on Thursday, with four games providing participants with first round byes. On Friday morning, we also continued a WAM tradition, matching up former PoG champs against one another in the first round: resulting in Drueding (AP) defeating Dockter and Byrd (CP) defeating Birnbaum (AP). Finally, we allowed players that prefer Barbarossa to Berlin instead of Paths of Glory to have at it; resulting in one epic match between Austin and Brooks going all 18 turns and being decided on the final die roll of the final card play. Saturday morning began with semi-final rounds between Byrd and Hickok and Drueding and Gutermuth. While the Byrd-Hickok game ended relatively quickly, Guternmuth (AP) took Drueding’s Defend the Rhine (CP) to the end game with a late threat from an assortment of angry Italians, disgruntled Serbs and opportunistic French Orient forces. That set the stage for a Final involving Chris Byrd (CP) and Tom Drueding (AP bid 2). The Guns of August event opened the Final. The early game went very fast as each side played mostly event cards. The AP was able to prepare for Italy by sending two French Armies to the Italian border. The CP fortified the Rhine and started moving an Army to Italy. When Italy came in a British Army was SRed down to Venice and the French Armies moved to Bologna the next impulse. Both the British and French were able to entrench on the first roll, effectively ending the CP aspirations for Italy. In the Near East the MEF landed at MEF 4 and Yudenitch came in late. Both arrivals were quickly countered by large stacks of Turks and Bulgars. The Caucasus made one attempt to breakout and was flipped. In the end it was nothing more than a distraction. The AP did not get the Sinai off till very late. The Turk armies arrived quickly and wiped out the MEF and made a move for Cairo before Allenby arrived but were unable to break out of the Sinai. Allenby eventually arrived and was threatening Jerusalem by Turn 17. With Italy locked and the Rhine fortified the CP started the march on Russia to Grodno on Turn 10. The Russians stopped the German right at Grodno and were able to dig a trench (eventually level 2). Grodno became the Verdun of the East with a trench, a fort and several German attacks (unable to break through). The Russians were able to funnel replacements continuously. It was not until the Austrians and three German Armies moved towards Dubno were they able to get through. Even that it was slow going against several Russians.The CP conceded on Turn 17; the only place the CP had to get VPs was Russia and the Treaty of Brest-Litovsk was looking very unlikely. The progress in Russia was just too slow, the weather was turning too cold and the trenches were just too deep.